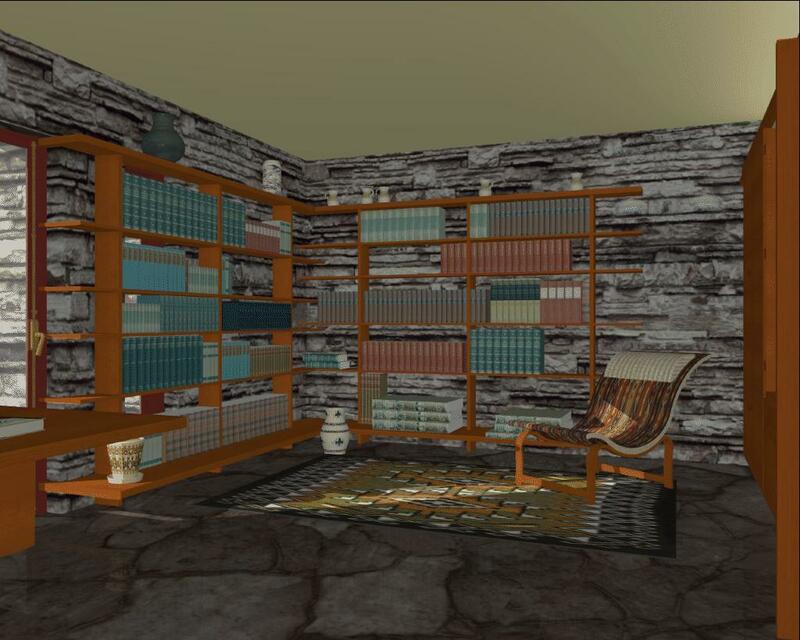 "Fallingwater" is a protected trademark owned by the Western Pennsylvania Conservancy. 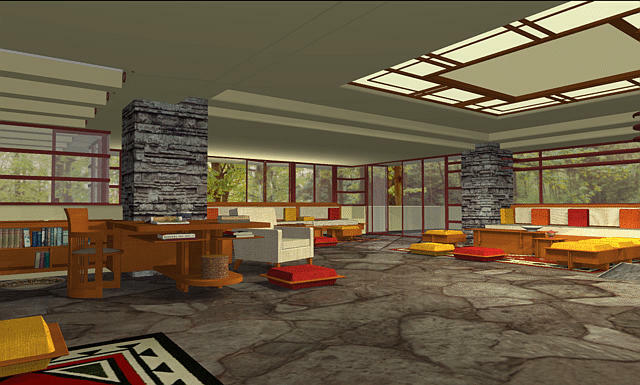 The Conservancy has given its permission for the name Fallingwater to be used at this non-profit, educational web site. Matt and Stephen combined to generate one of the most interesting computer models we have here at the PCG. 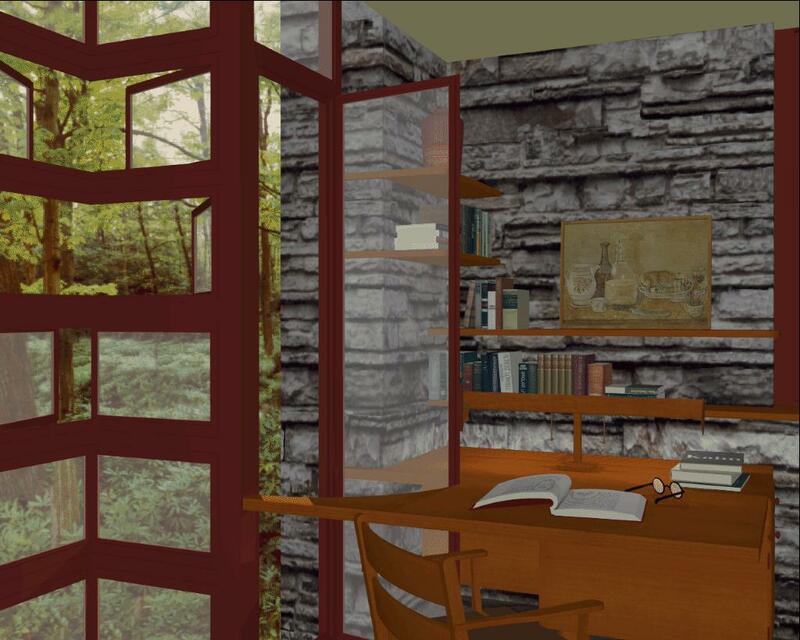 Their goal was to completely model the interior of Frank Lloyd Wright's masterpiece, Fallingwater. Because of the amount of work involved, many computer models are much like stage sets. The primary view may look good, but if the computer's camera is turned around, there is little or nothing of interest on the other side of the room. Similarly, a scene may look good at a distance, but if you move close to objects in the scene, their appearance can be rough or incomplete. Matt and Stephen successfully made a complete and detailed model that is suitable for many global illumination and interactive applications. The building's first floor is the centerpiece of the model. Comprised of 150,000 triangles and numerous texture maps, it has been used to test the latest global illumination algorithms here at the PCG. It is an excellent space for interactive "walkthroughs," allowing the user to explore a realistically lighted environment. If the viewer of the previous image walked forward a few steps and turned right by thirty degrees, they would see this fireplace. 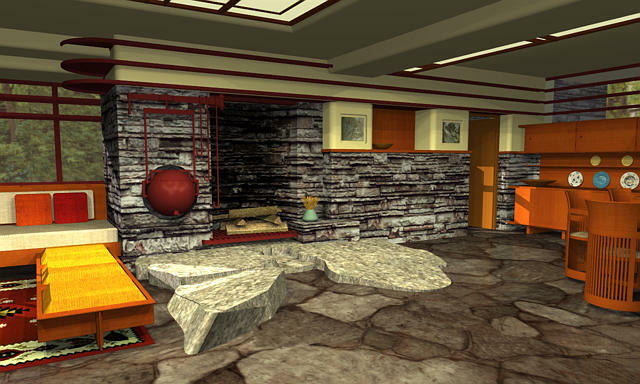 Many of the texture maps in this model were taken from Fallingwater itself, including the cement reliefs in this image and the stone walls. The forest cyclorama, placed around the model to simulate the woods, is a montage of photographs of the actual trees and bushes at Fallingwater! This library, from the building's third floor, is an example of the difficulties caused by complex models. Each of the curved surfaces in the room (in particular, the vases and the chaise) requires many triangles to represent its geometry. When our researchers try to perform a global illumination solution on this model, this increased geometry results in tremendous computer memory demands. The model of this building will continue to challenge our algorithms for years to come!